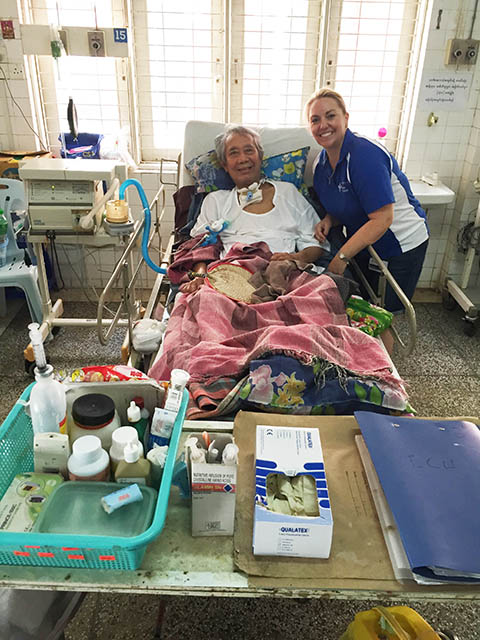 Irecently visited the Yangon General Hospital ICU with Kerriann Cox. She introduced me to a man with whom she has had a growing acquaintance since first visiting Yangon with the Open Heart International team three years ago. He has a tracheostomy and is connected to a ventilator, which helps him breathe. His communication is very apt, for a person in this unfortunate state. He can mime and whisper words, and makes me think the cuff is either very old or he doesn’t have one. More often it is impossible to verbally communicate with a cuffed tracheostomy. He tells us he has been connected to a ventilator for three and a half years. This man did had a significant position in the military and his wife is an eye specialist. He assures us his eyes are good! 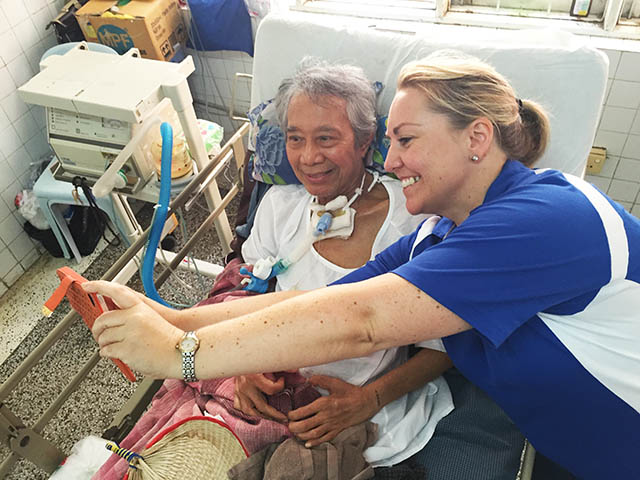 Myo Nyunt cannot breathe because of a brain stem stroke that left him with respiratory muscle paralysis. These days he can stands up out of bed, but never mobilises. A good example of human resilience, he still has a sense of humour and can laugh. His daughter visits him every day and another family member visits once per week. 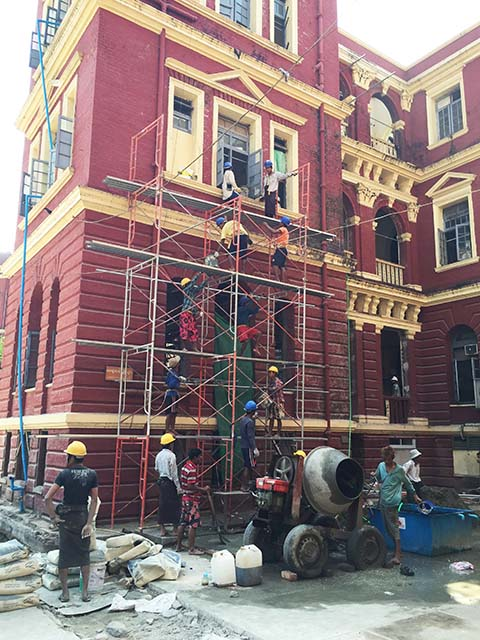 This year I can see a bit of building action occurring at the Yangon General Hospital (YGH). 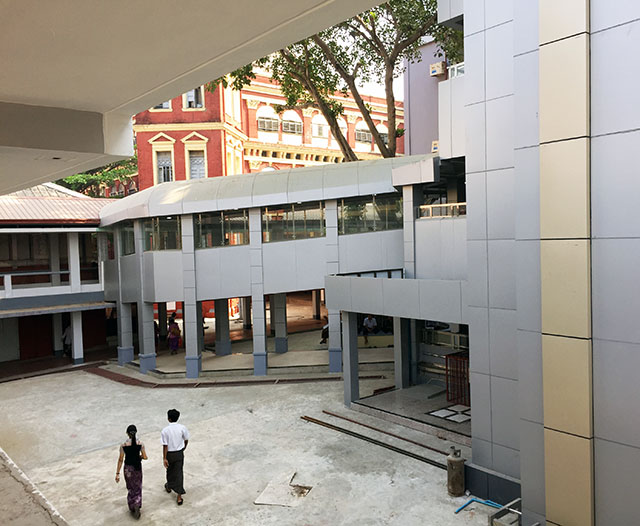 Yangon is rapidly opening up to the world and is going through a transformation, and YGH is obviously becoming part of that progression. New structures can be seen. Hopefully, they keep some of the old historical buildings. Building works involved with cleaning up part of the old section of YGH. Cement is mixed in that very large cement mixer, then passed up the the scaffolding by twenty litre buckets of cement. Each workman having to lift this weight up overhead to get it to the next guy above. Note the footwear. The recently built structures at the YGH that would have cost a lot of money. Simply astounding when one sees inside. 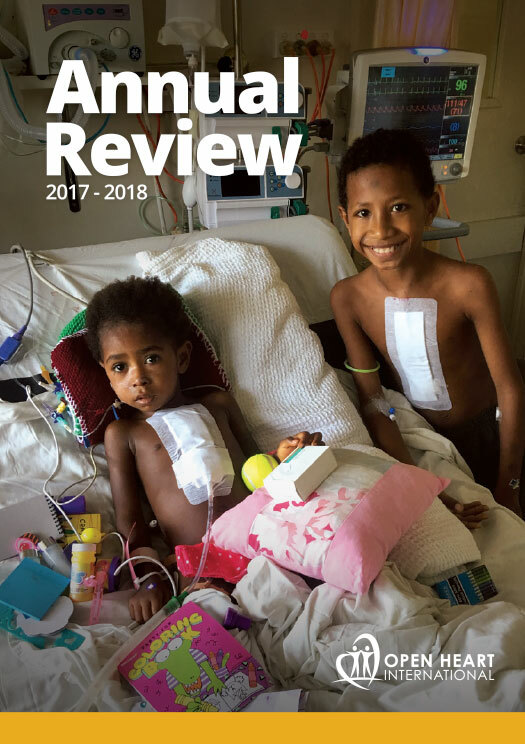 This hospital is still very substandard when it comes to medical equipment and staff expertise if you were to compare it to Australian hospitals. 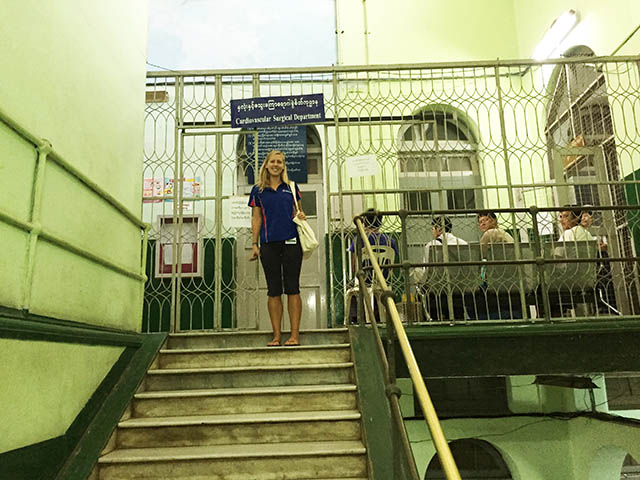 Picture (above): Registered Nurse, Noni McNamara stands at entrance to the Cardiac Surgical Department of the Yangon General Hospital.